With sleek locks fixed with gel, the slicked-back effect is both sophisticated and practical. However, creating this look in blonde hair, which is naturally finer or has thinned out due to bleaching or colouring treatments, is a lot more complicated. Here is our advice on how to successfully create this look every time! A successful slicked-back effect requires impeccably sleek straightened locks. Although the latter looks incredibly elegant, it also tends to emphasise if your hair is fine or lacking in volume. To avoid creating an unsightly inelegant look, opt for a suitable straightening technique. Straighten your locks with a flat paddle brush and a hairdryer, rather than using straighteners, to preserve some of the volume at the roots. Doing so will make all the difference. To slick back fine hair without flattening all of the volume, consider using styling pastes and texturizing gels which coat the hair shaft to make it thicker whilst fixing the hairstyle. Clever, eh? Also, play close attention to the gel's finish. This is important as a wet effect can slightly darken certain shades of blonde (this is the case for golden or dark blondes, not cold blondes such as platinum). In brown hair, this effect is unnoticed, but if you do not wish to alter the shade of your blonde, opt for a matt-effect wax instead. 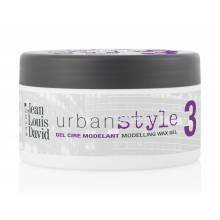 Good to know: always apply the product lightly and sparingly for a successful slicked-back effect in fine blonde hair!